Brand new and sealed 50 Gram Gold Bullion 999.9 Fine Argor Heraeus Kinebar Gold Bar. Each Kinebar comes sealed in a certicard, with its own serial number and hologrammed back. This 50 Gram gold bar is produced by Argor Heraeus, one of Switzerland's most prominent precious metals refineries. Argor Heraeus produce gold kinebars for investors in 1 gram, 2 gram, 5 gram, 10 gram, 20 gram, 1 ounce, 50 gram and 100 gram sizes. Argor Heraeus also produce investment bars in silver, platinum and palladium. 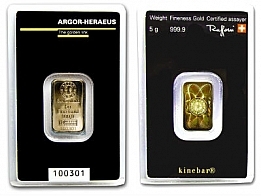 The front of the Argor Heraeus gold bar features the Argor Heraus logo, with the weight, finenesss and serial number of the bar. Each bar is individually sealed in its own certicard. The reverse features a hologram that has been inscribed onto the bar with a laser, thereby guaranteeing its authenticity. 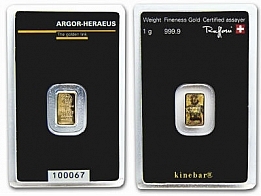 These Argor Heraeus kinebars are very popular with investors looking to buy gold bullion as they are beautifully designed and manufactured by a very prominent refinery in Switzerland. 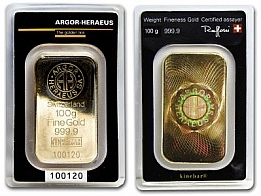 Argor Heraeus gold bars are available in sizes up to 1 Kilogram for investors looking to buy gold in larger quantities. Suisse Gold also buy Argor Heraeus back from clients looking to sell Argor Heraeus gold bars. 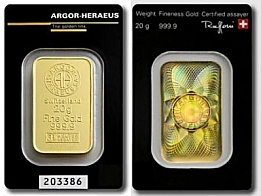 Please contact us to sell Argor Heraeus gold bars.